It’s unusual for me to criticize others observations about gloves. It’s also frustrating when I see seasoned business publication writers write opinions about gloves when their observations are unfounded, speculative, and wrong. So please let me vent. This morning, while reading the distinguished Forbes on-line (what else) business journal, I came upon a commentary about the absurdity of using white gloves for protecting documents by one of their writers, Nathan Raab. Although Mr. Raab was on the mark about the white gloves he collectively discredited, his single observation was based on a reality show. Really! What a shame to discredit gloves that serve a purpose to protect historical documents and archives. You can link to his story from the title of this post and you can see my commentary reply at the bottom of “his” article by clicking on the “expand comments” link. 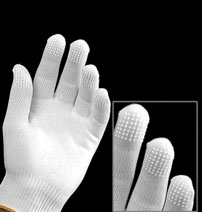 Maybe Mr. Raab should have searched the internet and he would have surely found me as an inventor (in the early 90’s) of white gloves specifically used for protecting our nation’s archives, documents, and films. My observation to Mr. Raab would be that it’s not rocket science and I doubt he would see the proper white gloves for protecting documents on a reality show. Maybe Mr. Raab will see these links after reading my reply to him. If Mr. Raab is as smart as I think he is, he may even contact me for a few samples of neat white gloves.